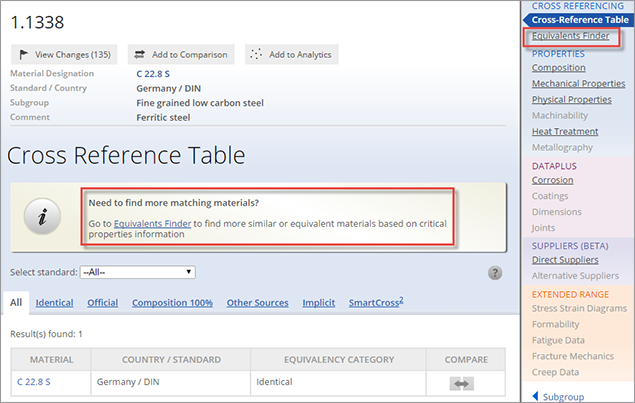 Equivalents Finder is a new functionality which allows you to find even more equivalent and similar material options inside Total Materia! Total Materia has more than 15 million connections between materials through our vast cross reference tables but sometimes even this may not be enough! 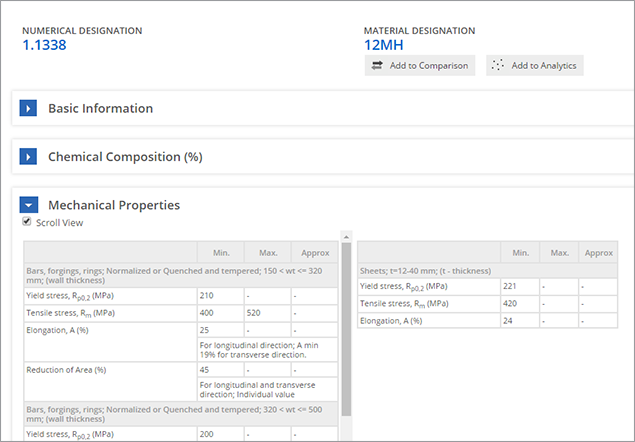 To help find additional options for material selection consideration, Equivalents Finder allows you to create a list of similar materials based on the properties most important to you. In this use case the task is to try and find suitable similar or equivalent materials for a low carbon steel which has limited analogues available through the traditional cross reference tables. To go to Equivalents Finder you can access either from the cross reference tables directly or click on the link in the side bar menu. To begin the search in Equivalents Finder you need to first select which properties you want to use as a basis for similarity. In this case Yield Stress is the first property we will add. It's also possible at this point to define information about the temperature range. Simply click add property to move to the next step. 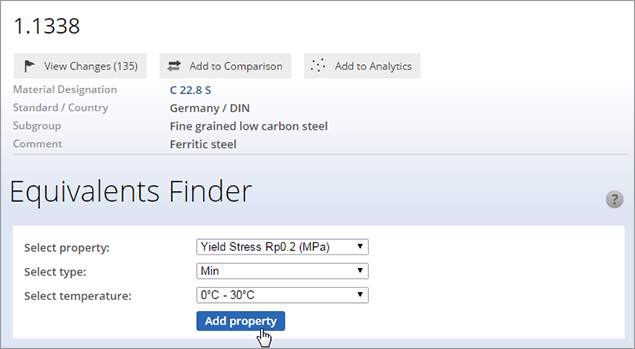 If you only want to find materials with a similar Yield Stress then you can optionally define your standards and select search sensitivity for the comparison. 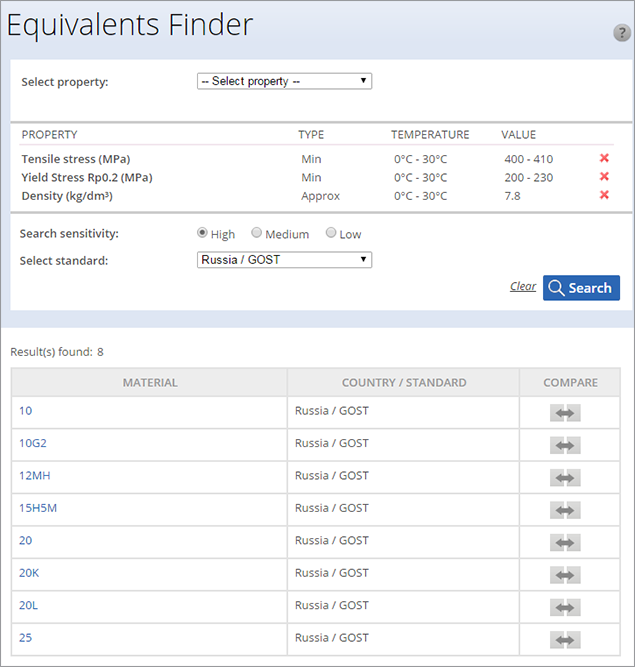 In this case however, we will add several more properties to the Equivalents Finder to narrow the list further. We are looking specifically for Russian materials which have a close match to our original German material. In the quick side by side comparison you can see that for yield stress, tensile stress and density we have found a material that matches very closely. It is also possible to add one or more of the materials in the results list to our other selection tools including 4 way comparison view and Analytics which allows you to view and compare multiple materials on the same chart.